You may think it would be miserable to visit Paris as a vegan with gluten sensitivity. However, I have successfully navigated the culinary gem with this lifestyle, staying true to my values and not getting sick while enjoying amazing food. In recent years, restaurants catering to these foods have been opening regularly in Paris. Although it takes time to research the options, it is time well spent to reduce frustration and missteps. Here are 5 tips for planning a delicious vegan and gluten-free vacation in Paris, though they apply to any city. Instagram is a wonderful place to learn about restaurants, see photographs of their food, and read mini reviews. Discoveries are made organically over time and it doesn’t feel like a chore. I follow the Instagram accounts of vegan restaurants, gluten-free restaurants, and people who live these lifestyles in Paris. Then I explore the associated websites of those I find intriguing and bookmark ones I want to try. The most influential person I have met through Instagram is the lovely Chiara of @bacididama_gf. An Italian based in Paris, Chiara also charts her journey of living a delicious life with Celiac’s disease on her website, Baci di Dama Gluten Free. The “Let’s Go Out” section features in-depth reviews of restaurants in Paris and other European cities and notes when vegan options are available. These reviews, in combination with Chiara’s daily posts of beautiful food, were a game changer. She showed me there is a wide variety of amazing vegan and gluten-free food available in Paris and eased my anxiety. Chiara also offers gluten-free food tours if you would like more guidance. In the months leading up to a trip, I conduct internet research. 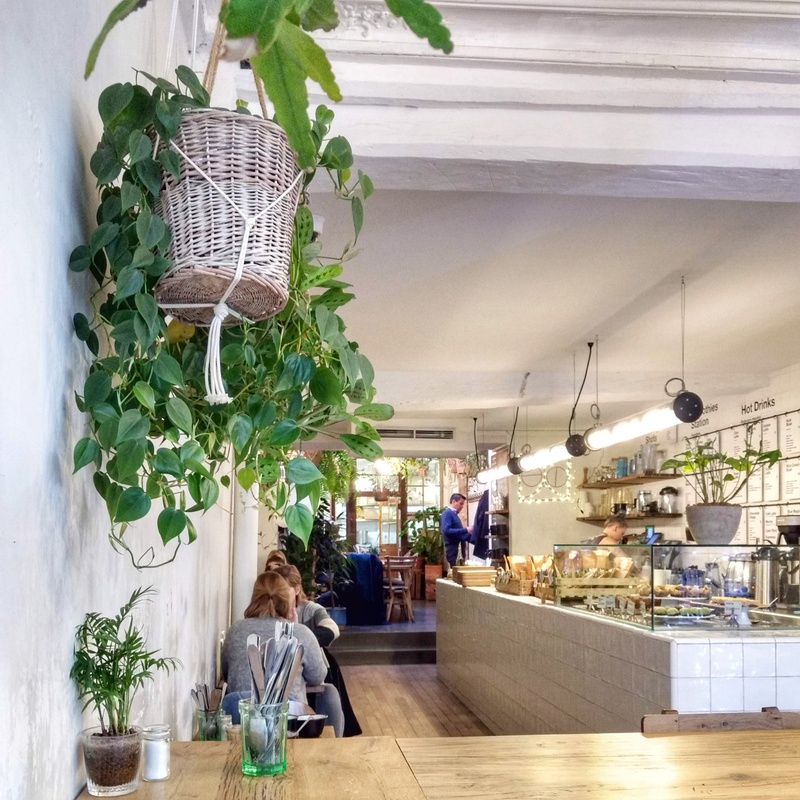 There are many articles about the best Parisian vegan restaurants and gluten-free restaurants. Though these mainly focus on the newest, many also mention more established and beloved eateries. Another good resource is Celiac-focused blogs. Searches such as “Celiac + blog + Paris” yield targeted results. I also peruse Happy Cow, a website and app that lists vegetarian and vegan restaurants in a city, or those with these options. However, Happy Cow does not indicate whether a restaurant has gluten-free options, so I use the “find on page” feature to locate the phrase embedded in reviews. Many vegan restaurants have some gluten-free options and vice versa, but the number that is both vegan and gluten-free is still small. Therefore, I visit each restaurant’s website to view the menu and ensure there are viable options. I also start a list with their address and opening hours. Once I have a good set of options, I organize my list of restaurants by arrondissement, the districts of Paris. Organizing it in this fashion allows both for planning and some degree of spontaneity. Having this document makes me feel empowered. I know we have solid options and won’t end up hungry and frustrated, or miss out on any fun because a meal makes me sick. 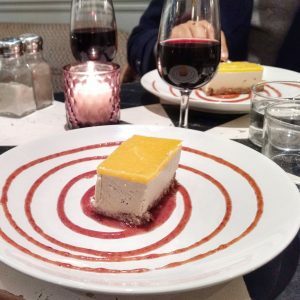 On our recent trip to Paris, we found it very helpful to book our hotel in the upper Marais, or 3rd arrondissement, due to its high concentration of restaurants we could enjoy. We could breakfast before venturing out to other areas of the city. Returning to the neighborhood for dinner allowed us to relax knowing we wouldn’t have to travel on the metro afterward. On our short walks back to the hotel, we often stopped off at a café to enjoy a glass of wine and watch local life. Spending so much time in one neighborhood gave us a real sense of its rhythms, inhabitants, and which fruit stand had the juiciest persimmons. Frequenting establishments led to restaurant and café staff recognizing and welcoming us. You can read more about why I decided to stay in the 3rd arrondissement in my previous blog post Slow Travel: A Nap in Paris. 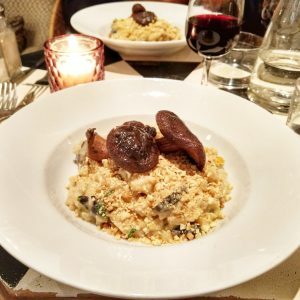 On our most recent trip to Paris in November 2018, we revisited some of our favorite restaurants with vegan and gluten-free options and also discovered new gems. This is by no means a comprehensive list, but here are a few we particularly enjoyed. Without the convenience of eating breakfast at the hotel, we must venture out. Luckily, on our first morning, we discovered the lovely Wild & The Moon on rue Charlot (they also have other locations) and made it our morning ritual. The clean, sleek interior of white tile, light wood, and plants creates a serene environment, though it can get crowded on the weekends. The entire restaurant is both vegan and gluten-free, so I didn’t have to worry about navigating the menu or explaining my gluten sensitivity. 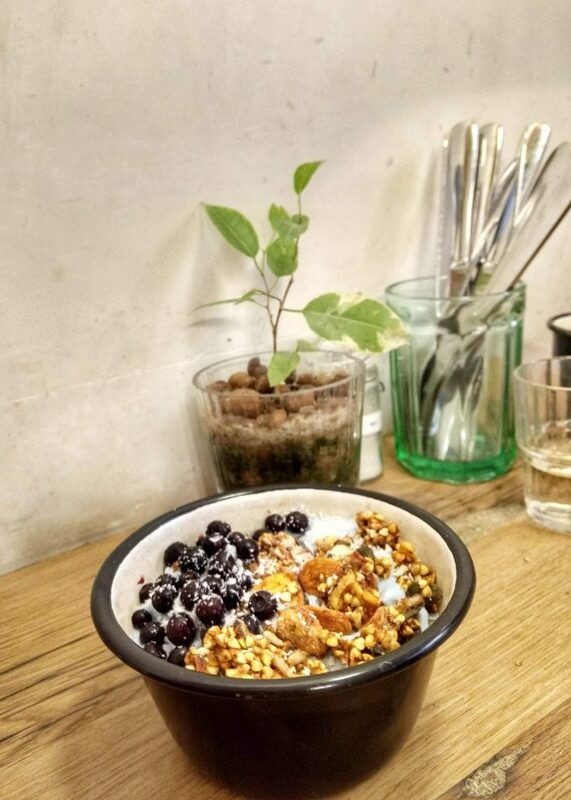 We particularly enjoyed the wide array of smoothie bowls topped with the best granola we’ve ever had. 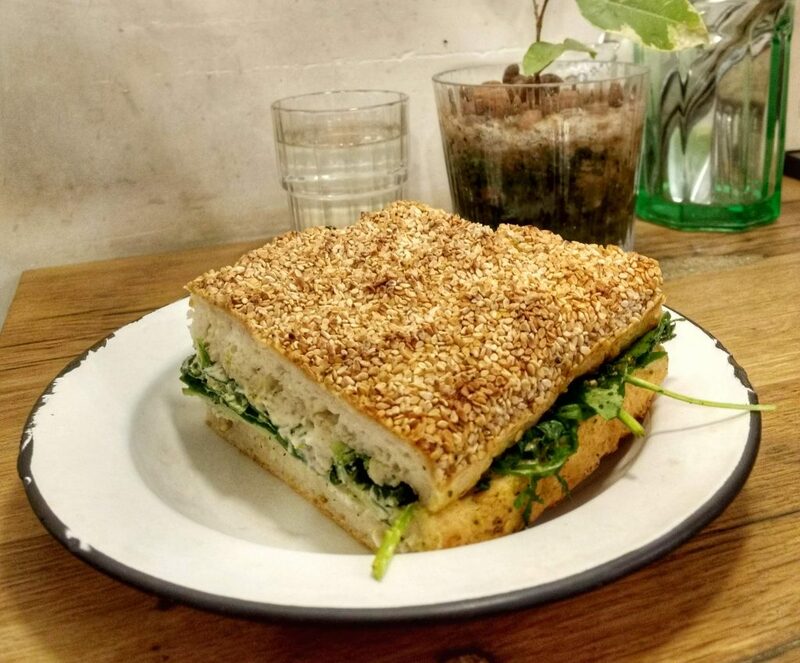 However, we still can’t stop raving about their rotating daily sandwich, served on the softest focaccia bread encrusted with either sesame or poppy seeds and loaded with vegetables and arugula. The day before we left, we ordered extra sandwiches to take with us on the plane. I always pack extra zip-lock bags and we stowed them in the hotel room’s mini-fridge. Even day old, we exclaimed that the bread was better than any gluten-free bread we’ve had in the U.S.
A favorite from last year is le Potager du Marais, on rue Rambuteau near the Pompidou Center. Unless you go at 5:00 p.m., you would do well to make a reservation for dinner, as they fill up quickly. Established in 2003, this vegan restaurant has some excellent gluten-free options. 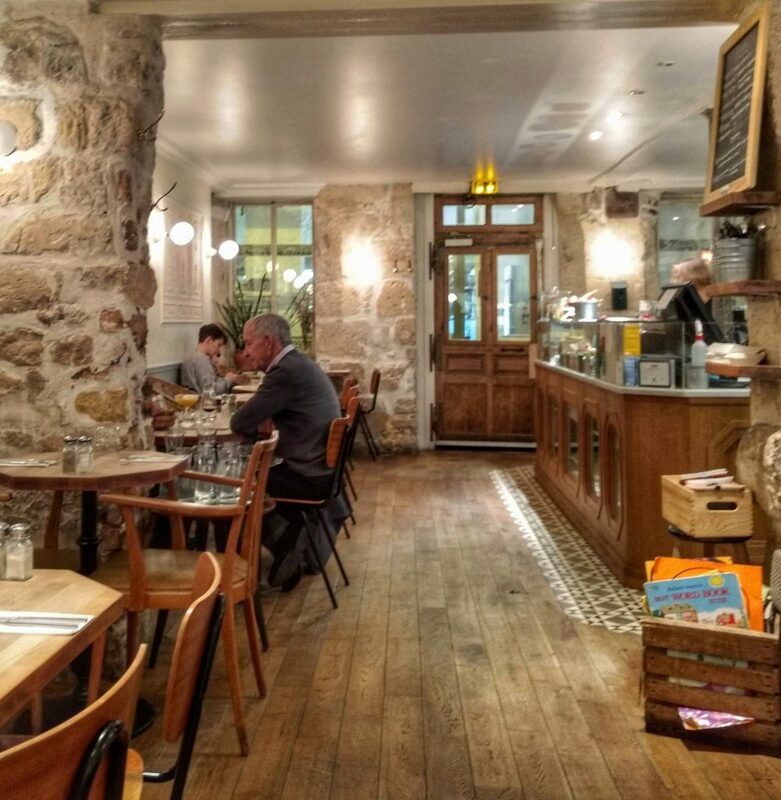 Le Potager du Marais has a delicious rotating daily soup and now offers gluten-free bread upon request. 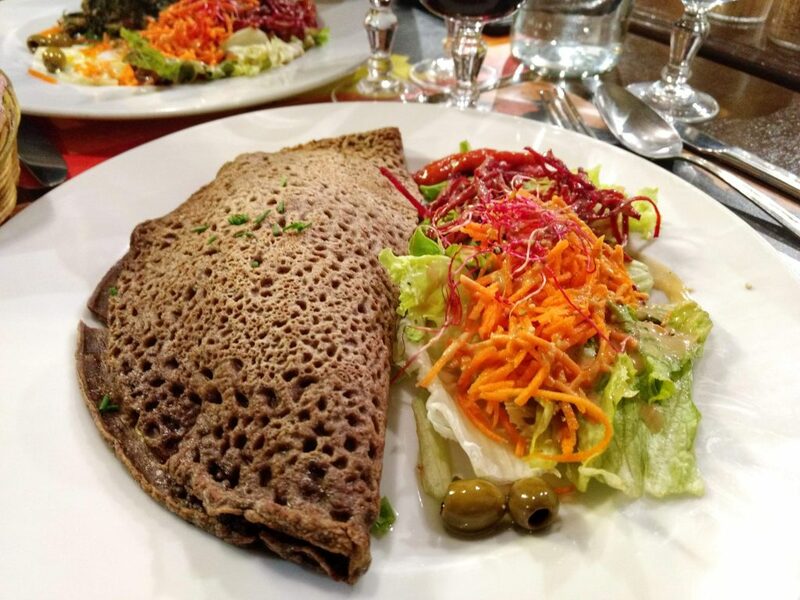 For the main course, my husband often orders the spinach lasagne (which is not gluten-free) and I order the buckwheat crepe filled with mushrooms and carrots in a rich leek sauce. We always splurge on desserts because they are divine and all but one are gluten-free. My favorite is the chocolate cake served with rich, creamy vanilla custard. Though the crème brûlée with a hint of apricot and carrot cake with walnuts are also delicious. 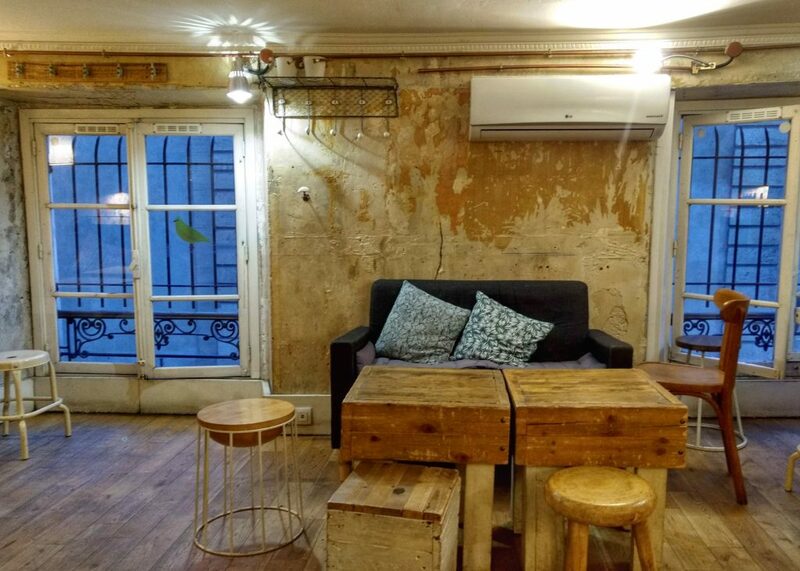 Café Pinson is located on rue Forez, just around the corner from Wild & The Moon, and they also have another location in the 10th. We immediately felt at home in their softly lit, roomy atmosphere. The restaurant is 100% organic, wheat and dairy free, and has vegan options. The staff was also very knowledgeable and accommodating. We both ordered the risotto topped with mushrooms as the main course. Warm and creamy, it tasted just like traditional risotto. Afterward, we enjoyed the equivalent of cheesecake with a citrus topping and berry sauce for dessert, which was delicious. On our last evening in Paris, we decided to dine at Café Pinson and linger over our romantic dinner. We had the risotto again, prepared slightly differently with a drizzle of pesto sauce and toasted pumpkin seeds. For dessert, I ventured out to try the warm apple crumble, which tasted homemade, perfect for a cold, late-fall night. We didn’t want to leave that evening and are already looking forward to returning one day. Our ace in the hole for times when we need something quick or outside of normal dinner hours is Hank Vegan Burger on rue du Archives. The restaurant is very tiny. You place your order on the ground floor and then dine upstairs. The vegan patties and selection of delicious set gourmet toppings are gluten-free. The soft, thick gluten-free bun will not leave you feeling slighted. Please note, the fries are not gluten-free but their coleslaw is delicious. It’s fun to sit in a 400-year-old shabby chic room and watch life on the street below. In closing, if you are vegan and must avoid gluten, Paris can be a delicious and welcoming place. With research and planning, you will go armed with a list of restaurants and eliminate the anxiety of traveling with an alternative diet. You will create wonderful memories and reminisce about amazing meals for years to come.